The government is meticulously following information as regards the steps taken by the Turkish side on the Cyprus problem and is getting ready to take specific actions which will be announced once they have been implemented, Government Spokesman Nikos Christodoulides has said. He also said that there are some very important references in the relevant resolution aproved by the UN Security Council, including the reference to resolution 1251 which describes the format of the solution, the fact that there are enhanced references to the fact that negotiations take place in the framework of United Nations resolutions, as well as the reference calling for the return to the status quo in Strovilia and for not acting in a way which would change the status quo. On the reference for a technical review of UNFICYP, he explained that it is not the first time that such a review will take place and he spoke of a new approach on the part of the US administration on peace keeping missions, adding that there will be reviews for all missions. At the same time, he informed that a number of countries, among which a big one, have expressed their readiness to contribute to Cyprus’ peace keeping mission with human resources. Asked to comment on a statement made by the Deputy Spokesman for the UN Secretary-General Farhan Haq that if the parties in Cyprus are willing to consider new confidence building measures in relation to reports from the Turkish Cypriot press that the fenced-off part of the city of Famagusta, known as Varosha, will be opened, he recalled that the recent measures announced by Turkish Cypriot leader Mustafa Akinci are actually the actions of Turkey. Therefore, under no circumstances do they constitute confidence building measures, he pointed out. He referred to the relevant paragraph of the High Level Agreement of 1979 and UN resolutions 550 of 1984 and 789 of 1992 which refers very specifically to the need to return the fenced-off city to the United Nations. e assured that the government follows and evaluates all information meticulously on a daily basis. Asked whether the government would advise refugees from the fenced – off city what to do if Turkey gives access to them to go and live there under Turkish occupation, the Government Spokesman noted that of course it will as it did in the matter of the invitation by the Turkish occupying army for the return of Maronites to their occupied villages. In that case, he recalled, we have expressed our position clearly. We are a responsible government and we will certainly express our position so that the Cypriot people can be informed. This, he added, can be derived from the fact that together with Greece we were the only side to submit very specific proposals in Crans-Montana. He further commented that in Akinci’s statements there is no reference to President Anastasiades’ challenge and invitation to say whether UN Special Adviser’s Espen Barth Eide’s allegations are true as regards the conversation during the final dinner at the Swiss resort. “Despite the fact that certain different approaches are absolutely respected and are legitimate it would never be right to give a picture of division within the Greek Cypriot side,” he pointed out, urging everyone to be careful in their public statements. Replying to a journalist’s comment that Akinci’s criticism has focused on President Anastasiades, the Government Spokesman pointed out that this is due to Akinci’s inability to refer to very specific facts as regards the positions expressed in Crans-Montana. He gave the example of the chapters on security and guarantees, and territory. He added that in the context of the discussion it was clear that the return concerned part of the Turkish occupied town of Morphou. Referring to the issue of the Maronite villages, he noted that the Turkish side’s position was against the will and true wish of the people of those villages. Cyprus has been divided since 1974 when Turkey invaded and occupied its northern third. The latest round of the UN-backed Cyprus talks in Crans-Montana, Switzerland, ended inconclusively. The peace talks under the auspices of the UN aim at reuniting the island under a federal roof. The Security Council established UNFICYP through resolution 186 (1964) on 4 March 1964 and has renewed the mission’s mandate for six-month terms since then. The fenced – off Varosha part of the once thriving holiday resort, on the eastern coast of Cyprus, has been fenced off since the 1974 Turkish invasion and according to the UN the Turkish military is responsible for it. 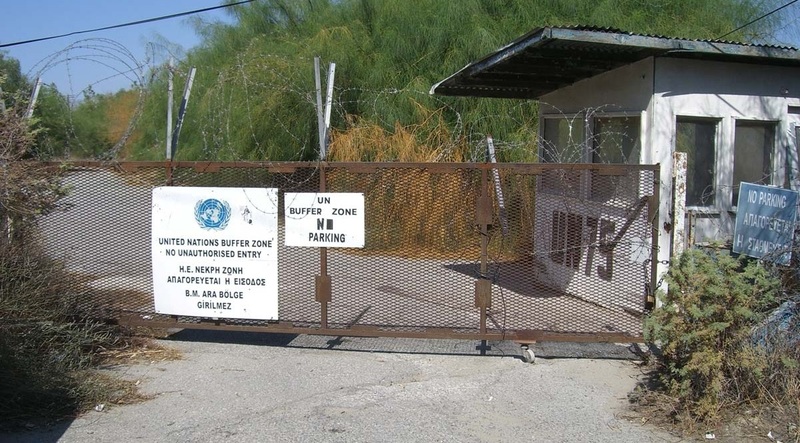 Repeated attempts to hand the fenced off area of Famagusta – known as Varosha – to UN administration and its Greek Cypriot legal inhabitants have so far failed due to the stance of the Turkish army. With the dust barely settled to this year’s Eurovision Song Contest since the elapse of a few months, the Cypriot broadcaster CyBc is expected to be announcing very soon the launching of a nationwide song contest, as a way of selecting our Cypriot tune, at 2018’s Eurovision Song Contest to be held in the Portuguese capital, Lisbon. The drawing up of the specific rules for our Cypriot national final will be soon to be officially released, and it’s believed, this will be as quickly as August or in the autumn. We here at London Greek Radio have also learnt some information about what shall comprise the local competition. The public contest will be applicable to Cypriot singers, ‘maybe’ also songwriters and composers… We ‘insert’ here… another option… the powers that be are seriously thinking of appointing a well-known ‘composer’, to pen our Cypriot tune. Our very own UK Cypriot songwriters, producers and singers of Cypriot origin, will have eligibility to be entering the race (only in the case of an ‘open’ final). In years gone by, our talented British Cypriot artists have noticeably left a strong impression on it, taking advantage of their chance to be entering Eurovision finals on the island. Now, as Cyprus regroups and looks towards the future let’s take a moment to reflect on the last couple of successful years. This year’s finalists ‘Hovig’ came 5th in the semi-final, continuing the qualifying streak, as we cannot forget the achievement of the up-beat Cypriot band Minus One in 2016. In 2015 John Karayiannis with the song ‘One Thing I Should Have Done’ – written by UK Cypriot Mike Connaris won the only Cypriot final we have seen, in the last three years. The local Eurovision delegation is certainly looking to make it a fourth qualification Cypriot entry in a row, from the selection procedure they are about to embark on. With the prospect of having a national song contest to choose our next entrant, the country’s Eurovision strategy for 2018 is starting to take shape. Head back to the London Greek Radio website for all of the latest developments including the release of the formal rules and regulations for the Cypriot Final, outlining the steps that must be taken to submit your potential entry to the Cypriot song competition. The Cabinet in Cyprus gave on Wednesday the green light to a proposal allowing state universities to establish businesses based on their research outcomes, Education and Culture Minister Costas Kadis said. In statements at the Presidential Palace, Kadis said that during today’s meeting the Cabinet approved the legal framework allowing universities to make the most of the scientific research outcomes, the innovations, the scientific knowledge which results from state universities in Cyprus and turn it to products and services which could be marketed to benefit the country’s economy and society. Kadis pointed out that the great progress achieved by Israel in the area of knowledge society has been based in such synergies. Replying to a question as to which areas this will focus on he said that there are no exceptions and no limitations. Wherever there are any outcomes they will be able to be put to use on a business level or on a services level to the benefit our economy and society, he noted. Greece has successfully returned to the financial markets on Tuesday after a three-year absence. The debt-ridden country has raised €3bn with a new five-year bond at a yield of 4.625%, which is lower than expected and even lower than the 4,95% that Greece sold its previous five-year bond in 2014. Investors demand “exceeded our expectations,” said the Greece’s Finance Minister Euclid Tsakalotos. The national Under-20 team is the new European champion, after defeating Israel 65-56 in Sunday’s final at Iraklio. Yet another golden generation for Greek basketball has made the most of the home advantage to win one more trophy in these categories of FIBA Europe competitions, before beginning to feed the men’s team with fresh talent and quality. This is the same team that two years ago won the U18 championship at Volos. The players of coach Ilias Papatheodorou took great strength from their quarter-final victory over Lithuania, when they came back from 15 points down, to thrash Spain in Saturday’s semifinal with a 77-56 score and then impose themselves on Israel in the final at the Dyo Aorakia arena on Crete. After a slow start, which Israel capitalised on to lead 14-2, the Greek teenagers worked hard in defense and played a composed game in attack that allowed them to unfold their talent and lead 26-23 at half-time, before breaking away in the second half. Players such as Vassilis Charalampopoulos, Antonis Koniaris, Nikos Diplaros, Michalis Lountzis and Vassilis Christidis are guaranteeing a great future for Greek basketball, both on national team and on club level. “These guys are making me so proud…” said Papatheodorou with tears in his eyes. Cyprus President Nicos Anastasiades has made strict demarches to the UN Special Adviser on Cyprus Espen Barth Eide over statements he has made in public on the reasons the process in Crans-Montana had a negative outcome, Government Spokesman Nikos Christodoulides has said. “Through the very specific and multiple questions he has posed Eide for every meeting which took place in Switzerland and the replies he has received, what we have said from the first day onward is confirmed that is to say that the reason talks in Crans-Montana failed was Turkey’s persistence for guarantee rights, for its right of intervention in Cyprus and for a permanent presence of Turkish army to continue,” he added. Replying to a journalist’s comment that Eide insisted that the subject matter of guarantees was not a problem, he reiterated that if this persistence continues then the minutes should be made public so that everyone can know exactly what happened in Crans-Montana. “It would be inconceivable that a Cypriot politician would have managed to achieve the abolition of the Treaty of Guarantees and of Turkey’s intervention rights and would then not accept such as settlement,” he pointed out. “I don’t consider that anyone of us believes that there would be a greater success in relation to the Cyprus problem if a Cypriot politician had such an outcome,” he added. Replying to a question as to whether Eide’s role has come to an end after recent developments he replied that he is now aware of Eide’s plans, adding that in the past he has told President Anastasiades he may be a candidate in Norway’s elections but it is not something which was discussed in today’s meeting. “When the UN SG, after a discussion of over four hours started to put down on paper this strategic agreement everyone hoped to reach in Geneva, after the first reference in relation to the abolition of the Treaty of Guarantees and of intervention rights, there was a reaction by Mr Cavusoblu. And there were many people at the dinner who heard Cavusoglu’s reaction that something like that could not be implemented from the first day,” he said. Cyprus has been divided since 1974 when Turkey invaded and occupied its northern third. The latest round of the UN-backed Cyprus talks in Crans Montana, Switzerland, ended inconclusively. The peace talks under the auspices of the UN aim at reuniting the island under a federal roof. Below you can read the letter sent by Christos Karaolis, President of the National Federation of Cypriots in the UK, to Foreign Secretary Boris Johnson with regard to the intentions of the Turkish Cypriot ‘administration’ to open Derynia beach in the occupied of Famagusta in Cyprus under the control of the Turkish military. Thursday night results are in and the Cypriot sides and one Greek club have all successfully progressed to the Third qualifying round of Europa League qualifying. AEK Larnaca sealed a 1-0 solid home win against Irish out-fit Cork City, taking a 2-0 aggregate victory. Florian (33’) diving reader redirects a team-mate’s shot in to the Cork net, which guaranteed their European adventure would continue in the competition this season. AEK Larnaca play Dinamo Minsk of Belarus in Third qualifying round. Meanwhile, AEL booked their passage to the next round after a convincing 3-1 aggregate score-line, defeating Progrès Niederkorn (agg: 3-1) at the Antonis Papadopoulos stadium. Fidelis (70’) fires in opener from distance, goalkeeper fumbling his shot. Françoise responds to level the score-line on 80’, but Lafrance (88’) pounces for late AEL winner after a team-mate’s shot is saved. AEL Limassol play Austria Wien of Austria in the Third qualifying round. Elsewhere, Apollon Limassol produced a stunning 5-1 aggregate under their belt, beating Romanian team Zaria Bălți 2-1 away at the Stadionul Zimbru, Chisinau. Alex (45’) converts Apollon penalty low to left just before break; Focşa loops in headed reply. Zaria’s Raţa sent off; Schembri (80) scrambles in winner after Zelaya shot is saved. Apollon play Scottish out-fit Aberdeen in Third qualifying round. Greek side Panionios produced a dramatic away victory 3-2, beating Športni Park, at Nova Gorica in Slovenia, advancing, with a 5-2 aggregate score-line. Masouras (11’) flicks opener; Yesil (16’) restores lead from close range following Kapić (15’) penalty. Lamprou clips away Panionios’s third on 23 minutes; Kapić (67’) scores second spot-kick after break. Panionios play Israeli team Maccabi Tel-Aviv in the Third qualifying round. The President of the Republic of Cyprus Nicos Anastasiades urged everyone on Thursday to reflect on the causes that led to Turkey’s invasion, on July 20th, 1974. He said that the international community is beginning to realise that the fundamental cause of Cyprus’ division is the presence of the Turkish occupation army. ”Forty-three years later some mourn but others cheer. Those who mourn are those who have lost their loved ones, their homes, their religious and cultural heritage by the force of arms but also those whose next of kin are still listed as missing,” the President said. Some others, but mainly Turkey, are cheering, because under the guise of being a guarantor power, they invaded and forcibly displaced 167 thousand Greek Cypriots, murdered thousands, left behind missing persons and vandalised sacred sites, the President noted speaking to the press after attending an official church memorial service held at Faneromeni Church in Nicosia, for those killed during the invasion. The President said that the solution of the Cyprus problem must respect everyone’s human rights. The termination of the guarantees system, he stressed, is a sine qua non if one wants to create a truly independent state which will not serve third parties, but its own citizens. ”The 20th of July is a dark day and we must all reflect on its causes,” Anastasiades said and referred to the coup that took place on the 15th of July 1974, engineered by the Greek military junta in Athens against the then President of Cyprus Archbishop Makarios III, that preceded the Turkish invasion. Asked how Turkey will be forced to abide by international law, the President answered: “slowly but gradually”. Anastasiades said that the international community, especially the EU, but not only the EU, is beginning to realise that the main cause of the division of Cyprus is the presence of Turkey’s occupation army, the system of guarantees and the right to intervention, as some claim. He expressed the conviction that ”gradually but firmly Turkey’s behaviour is creating the need to exert pressure on Ankara exactly because of its attitude,” the President said in his remarks after attending the annual official memorial service for those who fell during the Turkish invasion of 1974, at the Panayia Faneromeni church in Nicosia officiated by Archbishop Chrysostomos II. Wreaths were laid by the President of the Republic, the Archbishop, House President Demetris Syllouris, Ambassador of Greece in Nicosia Elias Fotopoulos on behalf of the Greek government, on behalf of the Greek Parliament by Second Vice President Giorgos Varemenos, political party leaders, the National Guard and Police chiefs, organisations of the relatives of missing persons, students’ organisations and other organized groups. Lawyer Christos Triantaffilides, in his speech, said that at the Conference on Cyprus in the Crans Montana resort in Switzerland no breakthrough was achieved because Turkey reaffirmed its long standing plans for Cyprus which include the maintenance of its control over the whole of Cyprus, ”militarily through the guarantees system and its army and institutionally through its demand for a Turkish Cypriot positive vote for all substantial decisions, a vote that will be guided by Turkey”. ”Our goal must be to bring the Cyprus issue back to its real basis, which is the illegal invasion of Turkey, 43 years ago, and the continuous illegal occupation of the northern part of the island,” he added. Cyprus champions APOEL Nicosia booked their place in to the Third qualifying round of the Champions League after De Camargo converted a penalty on 40′, as APOEL scoring the only goal of the match sealed a solid win. The reigning Cypriot champions doubled their aggregate lead following last week’s home victory, 1-0 against the champions of Luxembourg Dudelange in the first-leg Second qualifying round. The Cypriot side travelled to the Stade Jos Nosbaum stadium, with a good raucous support of travelling APOEL fans, with the game played on 19th July, 5 pm kick-off UK time. The Cypriot side will face Romanian champions FC Viitorul Constanța in the Third qualifying round, with ties to be played on 25/26 July & 1/2 August.